The past year I have been investing my energies in to FLY Children’s Art Center. I began as an instructor, moved to the board and took over as interim Executive Director. We have just hired a permanent ED who I am extremely excited about. FLY’s mission and people are amazing to work with and I quickly became engaged. Thus, studio news has been slow. 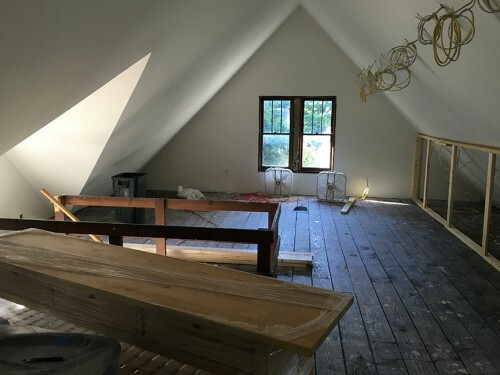 But progress has been made both within our practices as well as renovating our actual studio space in the attic of our new, old house. SO CLOSE! We’re involved in a few events coming up this fall so mark your calendars and come out and check out the goings on when you can. FLY will have a pavilion at the Ann Arbor Art Center’s POP X 2016! Throughout the even we’ll have an installation and projects inspired by our community collaborations this summer about geologist, Marie Tharp. My collaborator, Linette Lao, and I will be facilitating a new workshop, “Move the Needle with Your Creativity” at the 2016 WXW Forum. Zach and I are partnering his company, Isobar, and FLY Art Center in an exciting new pilot program to bring design workshops to kids in southeast Michigan. Tagged Fall Events, FLY Art Center, Marie Tharp, POPX, WXW. Bookmark the permalink.